Lighthouse Point Concrete Vent Blocks from Atlantic Coast Precast will really impress you! When you hire us we will make you our top priority. Since starting our business in 1965 we have provided our customers with the exceptional services they deserve. Our concrete vent blocks are excellent at offering protection against elemental and environmental conditions, while still allowing light and air into the space. You can choose concrete vent blocks in any shape, design, or size, so do not hesitate to make any special requests. Our low-maintenance concrete vent blocks will not disappoint you, as they provided exceptional ventilation while making any space more beautiful. Lighthouse Point Concrete Vent Blocks from Atlantic Coast Precast are more affordable than many of our competitors. 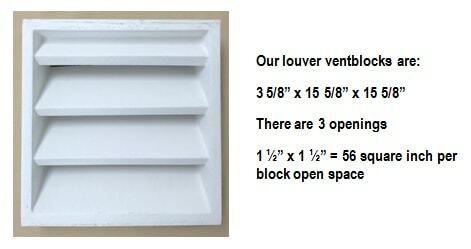 Contractors, architects, engineers, designers, and other industry professionals love our concrete vent blocks. They are made of two pieces, the block and the screen, which allow for cross-ventilation in spaces such as range goods, foundations, and garages. To fully defend your space against unnecessary moisture use foundation and exterior vents. Our concrete vent blocks are reinforced with a galvanized frame so they are designed to be strong and long-lasting. You will not regret your decision to hire us, so call us today to hear more! Lighthouse Point our Concrete Vent Blocks offer full protection against damp rot and termite infestation. By using foundation and exterior vents you will be able to allow air to flow naturally underneath your home or business. With adequate ventilation fresh air will help to remove musty, moist air. Our state-of-the-art molds help us provide you with exceptional quality at an affordable rate that you will love. To discuss your specific needs contact our team of experts today. We look forward to assisting you!